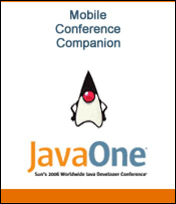 The JavaOne Mobile Conference Companion is a guide to highlights and current events surrounding the 2006 JavaOne Conference. 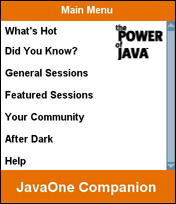 The JavaOne Mobile Conference Companion contains show highlights, featured speakers and late-breaking news. The MCC was designed and produced by Kallisto Productions, Inc., a firm specializing in content-based productions for consumer-grade mobile phones. Using Kallisto's WYSIWYG authoring system and runtime player, an interactive presentation can be designed, tested and deployed without any custom programming or code porting. The MCC is deployed to attendees using an end-to-end deployment system. This system allows the attendee to initiate the download process with an SMS message and receive a version of a midlet appropriate to their handset.